"This is toxic masculinity in action." 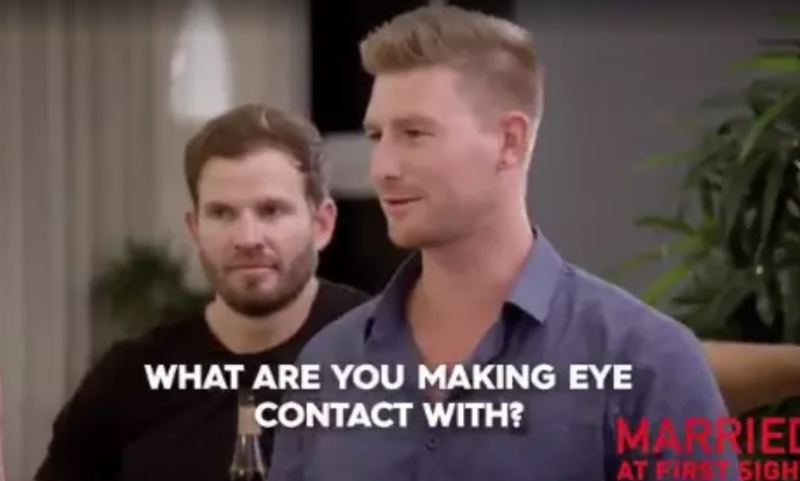 Last year, Married At First Sight caused massive controversy when a "boys night" episode aired, which depicted some pretty gross behaviour by the grooms on the show. During the episode, groom Andrew “Jonesy” Jones, made vulgar jokes at the expense of his “wife”, Cheryl Maitland, commenting on everything from her intellect to her hair extensions. He then made lewd gestures about her breasts, to the amusement of some of the other grooms. Later, the men involved denied any wrongdoing, using the "boys will be boys" mentality as an excuse. The episode and aftermath left many viewers upset. Despite the controversy of the year before, last night the show aired another episode depicting a "boys night". Once again it highlighted some disgusting behaviour amongst the grooms as they talked about wife-swapping, who's wife was the "hottest", and if any of the wives had "hot mums". Needless to say, viewers were not impressed. Australian writer and comedian Rosie Waterland also called out the show, stating women “are not objects to be commodified and traded”. And people were angry at Channel Nine for airing the footage. The last few minutes of #mafs “boys night” is so awful I need to now question the editorial decisions of Channel 9. Really? After everything women have just been through with #metoo #itstime #barnabyjoyce #timworner - this is what you choose to broadcast? Very, very disappointed. Notably, one of the grooms, Patrick Miller, slammed the other men on their behaviour, saying it was "disrespectful". The groom at the centre of the controversy, Dean Wells, later uploaded (then deleted) an Instagram post, shifting blame onto producers for the behaviour depicted. He also said footage of Patrick participating was cut from the episode. "They did show me asking the question about the other wives' mums, which the producers forced me to say because the night was too boring. No disrespect was ever meant to any wives or women in general," he said. The show is now promoting tonight's episode, where the women "find out" what was said about them. BuzzFeed has reached out to Channel Nine for comment.